I've been so caught up with grading, thesis nonsense, and just life in general that I've been neglecting my poor lonely blog. Instead of blogging, I've been writing tests and quizzes. Instead of reading your blogs and commenting, I've been proofreading my thesis and making corrections. And you know what they say about "all work and no play"... I need a break! To that end, I am putting down the red pen until Sunday evening. I am taking a break from grading and saying hello to relaxing. I am putting aside the thesis and visiting your blogs. 1. In the story of my life the actor who would play me would be Audrey Tatou. I've been told I look like her, and I think she has the right blend of sweetness and quirkiness to play me. Plus I've got French on my dad's side of the family, so it doesn't hurt that she's French, too. 2. If I could change one thing about the world it would be for more people to be open minded. What is hurting us as a society today is our lack of understanding -- of communication. If we would just open our ears and our minds, we might be able to come to an understanding . 3. Yesterday was a long and tiring day, but ultimately a great one, because I spent most of it with my boyf. 4. My favorite comfort food is toast liberally slathered with a healthy serving of Nutella. 5. My new favorite blog find is Occupation: Girl. Cleolinda is one of the funniest bloggers I've ever read. 6. If I could meet any blog friend (who I haven't met yet) in real life, I'd choose to meet Danielle from Dinosaur Toes. I loved her blog at first read and I have a feeling she'd make an awesome real life friend. 7. 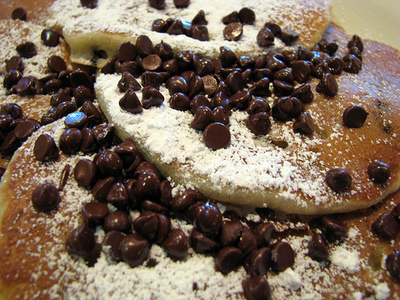 My favorite breakfast food is chocolate chip pancakes. Is it strange that I LOVE chocolate but I can't stand it in my pancakes? lol. Actually, I don't like anything on my pancakes that isn't a lil butter and some maple syrup... mmm.. I wants now!